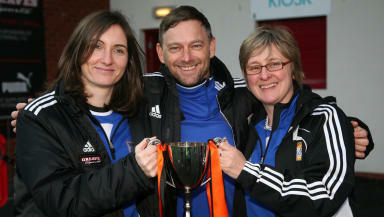 Laura Montgomery and Carol Anne Stewart set up Glasgow City Football Club in 1998. Fifteen years ago, two friends came together to see if they could make a difference to women’s football in Scotland. Laura Montgomery and Carol Anne Stewart (Cas) were both players for the Maryhill Eagles in Glasgow but they thought that the women’s game could be better. They wanted to create the most successful club in Scottish women’s football and compete against the top teams in Europe. Now, more than a decade later, they are the respective manager and chairwoman of the current Scottish Premier League champions, Glasgow City FC. And their team is about to face off with the best in Europe in the Champions League in August. It was when Laura, from Glasgow’s South Side, tore her cruciate ligament at the age of 19 that she had time to reflect about the game that she had been involved in for the past year. She said: "I didn’t know then how long I would be out for but it ended up being three years. "While I was out injured I got speaking to a lot of the other players about women’s football and Cas and myself started to think if things could be done a bit different and if we could set up our own football team. "We spoke a lot about it and we decided we would do it. "We held an event and invited Premier League players and First Division players and spoke about what our intentions were and how we were going to create the best football team Scotland has ever had." She added: "Back in 1998 was possibly one of the best times to do it as there was the top league and the rest were all regional first divisions. "If you won the league then you had a good chance of getting into the Premier League. Now it would take two or three years before you could progress." The team soon managed to get local coaches involved, including a Glasgow taxi driver, and managed to get sponsorship from Nike in the first year. "Some players joined us from the Premier League as they believed in us and what we were trying to do," said Laura. "We started in the First Division West and won. We then moved up to the Premier League and came fifth. "Ever since that first year we have always finished in the top two." Laura, 37, works full-time as a consultant in the oil and gas industry as well as managing Glasgow City FC, while Cas, 46, has to balance her job as an insurance training manager. But despite the challenges that still exist within the women’s game, Laura admits that things have changed a lot in the last 15 years. She said: "Women’s football 15 years ago is very different to what it is now. "I hope that our club can take some of the accolade of what has been achieved in that time. We used to train two evenings a week and then have a match on a Sunday. "Now we train five times a week and have a match on a Sunday. "We took the attitude that we had to become professional before being recognised as a professional team." Players work full-time during the day and often go to the gym in mornings or during their lunch hour before team training sessions at night. But, despite increasing training times, the team knew there was still more to do if they were ever going to be regarded as a professional team. "We knew we were never going to be competing with other European teams without a professional coach," said Laura. "We were the first club in Scotland to hire a professional coach, Eddie Wolecki Black, and it has had a huge benefit to the club." Youth teams were also set up four years ago to ensure the longevity of the club. 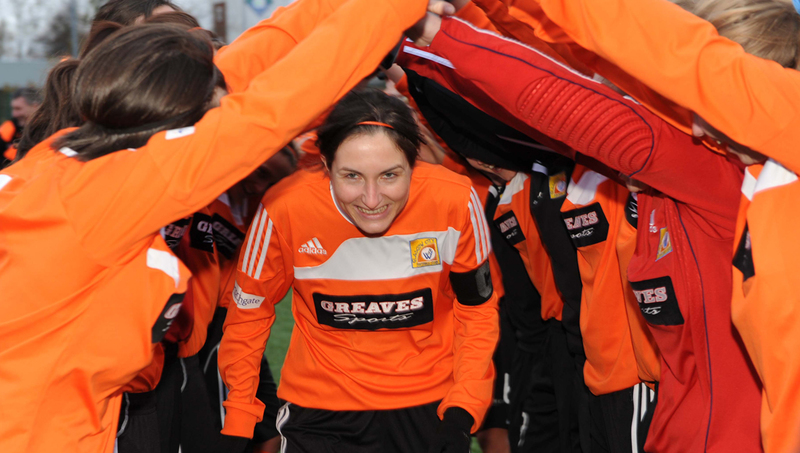 Laura added: "I would like to see the women’s game go semi-professional and then professional. "The game has progressed significantly; every Premier League team has to get a league club licence and have a high standard of stadium. "Fifteen years ago, we were sponsored by Nike in the first year, but teams were scrimping and scraping to get money for strips. Now we have strips that are sponsored by Greaves and Adidas. "But we are still years behind our counterparts in England and abroad." Despite still having big dreams as the club reaches its 15th year, both Laura and Cas have had time to reflect on everything they have achieved. The first team have won the Premier League title seven times and have been runners-up five times. In total, the first team has won 17 senior trophies which equates to more than one major trophy per year - a statistic unmatched by any other Scottish side in the history of Scottish women’s football. 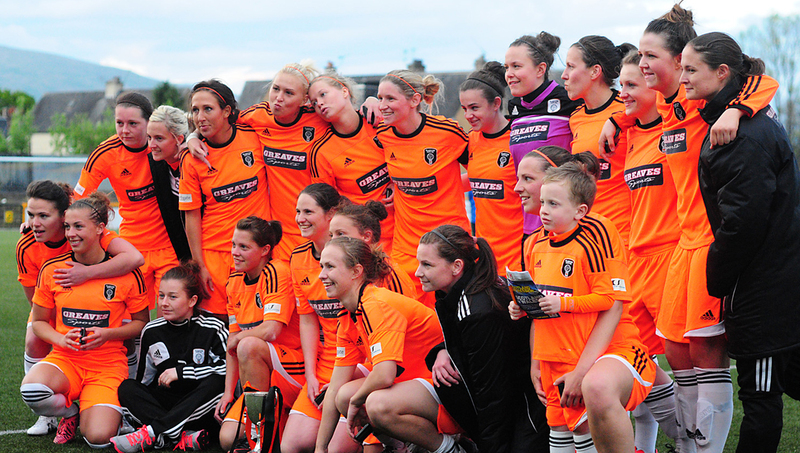 Glasgow City regularly attract attendances of 150 and up to 300 for bigger games. The club has also sold replica shirts across the globe in countries like Australia, Canada, USA and Poland showing the wide and growing fanbase. Laura said: "We have never really sat back and thought about what we have achieved but, at the end of our last season, we were at an event in a local hall with hundreds of players of all ages and their families and it was amazing to see everything that we have developed. "Everything that we said in that speech 15 years ago we have achieved but we also still have an awful lot more to do. "We want to have our own stadium and we want to be semi-professional. If we don’t get to that level then we are never going to compete."